JACKSONVILLE, Fla. -- Walking through the compacted dirt across from her home, Mandarin resident Christine Conner reminisces about what used to be. "You know what's sad? Is that my kids used to -- it was like our forest. That's where they played, you know?" Conner bought her house 17 years ago, in large part because of the old-growth live oak right outside her door – the very kind removed in a vast interstate clear-cutting, as the Department of Transportation makes way for toll roads. JACKSONVILLE, Fla.- Cut down in the prime of his life. The father of a 13-year-old who died in a car crash in Mandarin on Sunday spoke to First Coast News. "Pain. Deep pain, Devastation." Larry Schaub said about his heart, following the death of his son. Flowers mark the spot where his youngest of 4 sons, Garrett, died in a car crash Sunday morning. "He was a very outgoing, fun-loving kid," Schaub said of his son. "He lived for the moment. He brightened up any room." 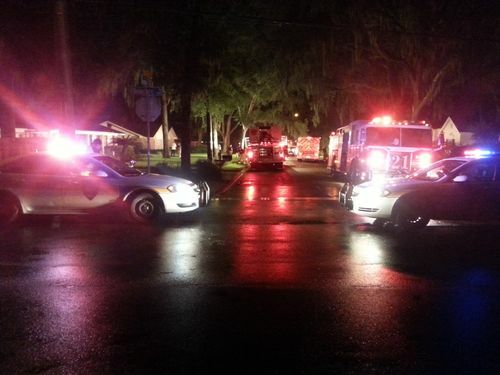 JACKSONVILLE, Fla. -- Jacksonville Fire and Rescue responded to a residential fire in Mandarin Friday night. A spokesperson with JFRD said firefighters had difficulty gaining access to the home due to a large amount of clutter in the residence located in the 9400 block of Beauclerc Oaks Drive. The fire was possibly started by a lightning strike. No injuries were reported. JACKSONVILLE, Fla. -- Minor damage remains after a tree fell close to a school on Wednesday night. It happened on Dupont Avenue in the San Jose area during a severe weather event. The large tree, located in the backyard of a private residence, crashed through a fence and landed partially in the road. Traffic had to be blocked while crews cleaned up the debris. No one was injured. JACKSONVILLE, Fla. -- Jacksonville Fire and Rescue responded to a residential fire Wednesday afternoon in Mandarin. Fire was showing when fire crews arrived at the home in the 4200 block of Pilgrim Way. It is unknown at this time if anyone was in the home when the blaze broke out and a cause has not been determined. According to city property records home is about 1,300 square feet in size. Property website Zillow.com values the home at about $126,000. JACKSONVILLE, Fla. -- A proposed re-zoning is leaving dozens in Mandarin saying it could destroy their way of life. At issue is about 18 acres of land off Joda Lane in Mandarin. Right now, the area only has a few residents, and a lot of land. If the re-zoning is approved, almost 70 houses would be built on those 18 acres. "It's going to totally ruin the whole area," said Kay Boykin. She's lived in the area for almost 40 years. "It's quiet and peaceful and serene now, and that's why we moved out here," she said. The planned re-zoning is far from a done deal. It has to clear several committees before council can approve it. Neighbors like Boykin say an approval is a big step backward. "This is what we want -- we want this peace and serenity out here," she said. JACKSONVILLE, Fla. -- The student who allegedly brought a gun to Mandarin High School on Thursday has been charged with two felonies. The teen, 17, is being charged with possession of a firearm on school property and dealing in stolen property, according to a Jacksonville Sheriff's Office arrest and booking report. According to the report, the teen told officers "he was having a 'beef' with some guys on the Westside and needed it for protection." He also told officers he paid $150 for the gun two years ago. First Coast News has chosen not to release the name or the photo of the juvenile.